Harry Callahan: "I know what you're thinking. "Did he fire six shots or only five?" Well to tell you the truth in all this excitement I kinda lost track myself. But being this is a .44 Magnum, the most powerful handgun in the world and would blow your head clean off, you've gotta ask yourself one question: "Do I feel lucky?"" This film is flawed in many ways, but still manages to be quite entertaining. Also it features one of the creepiest villains ever. If this were anyone else but Eastwood it might be comical but he manages to make it work with his sheer charisma and confidence. It has great action and some occasionally memorable dialogue. Everything is so ugly and grungy that it's hard for me not to like. Controversial by being critical and conservative at the same time. The film contains a discontentment about the post-68 US and its 'anomalies' depicting a morally corrupt society similar to Taxi Driver. Yet unlike TD, DH embraces an 'old-school' cowboyish detective punishing degenerates (remember Harry mocking a black thug in the same way he kills the pervert) in an extra-judicial way. It's also interesting that we have a 1st person camera imitating new technologies of surveillance. Original! Starts great, but it is just too clunky and dumb. 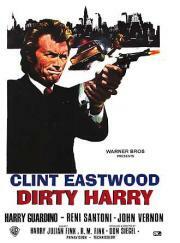 -- Strangely, I liked Magnum Force a lot more than this film.